The very first time the concepts behind the juju project were presented, by then still under the prototype name of Ubuntu Pipes, was about four years ago, in July of 2009. It was a short meeting with Mark Shuttleworth, Simon Wardley, and myself, when Canonical still had an office on a tall building by the Thames. That was just the seed of a long road of meetings and presentations that eventually led to the codification of these ideas into what today is a major component of the Ubuntu strategy on servers. Despite having covered the core concepts many times in those meetings and presentations, it recently occurred to me that they were never properly written down in any reasonable form. This is an omission that I’ll attempt to fix with this post while still holding the proper context in mind and while things haven’t changed too much. It’s worth noting that I’ve stepped aside as the project technical lead in January, which makes more likely for some of these ideas to take a turn, but they are still of historical value, and true for the time being. In a simplistic sense, deploying an application means configuring and running a set of processes in one or more machines to compose an integrated system. This procedure includes not only configuring the processes for particular needs, but also appropriately interconnecting the processes that compose the system. 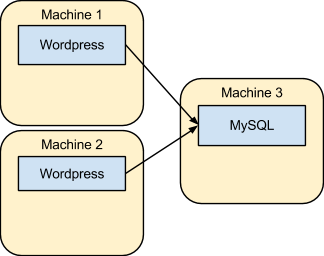 The following figure depicts a simple example of such a scenario, with two frontend machines that had the Wordpress software configured on them to serve the same content out of a single backend machine running the MySQL database. Deploying even that simple environment already requires the administrator to deal with a variety of tasks, such as setting up physical or virtual machines, provisioning the operating system, installing the applications and the necessary dependencies, configuring web servers, configuring the database, configuring the communication across the processes including addresses and credentials, firewall rules, and so on. Then, once the system is up, the deployed system must be managed throughout its whole lifecycle, with upgrades, configuration changes, new services integrated, and more. The lack of a good mechanism to turn all of these tasks into high-level operations that are convenient, repeatable, and extensible, is what motivated the development of juju. The next sections provide an overview of how these problems are solved. Before diving into the way in which juju environments are organized, a few words must be said about what a juju environment is in the first place. All resources managed by juju are said to be within a juju environment, and such an environment may be prepared by juju itself as long as the administrator has access to one of the supported infrastructure providers (AWS, OpenStack, MAAS, etc). This will start a machine in the configured infrastructure provider and prepare the machine for running the juju state server to control the whole environment. Once the machine and the state server are up, they’ll wait for future instructions that are provided via follow up commands or alternative user interfaces. These commands will communicate with the previously bootstrapped environment, and will input into the system the desired model. The commands themselves don’t actually change the current state of the deployed software, but rather inform the juju infrastructure of the state that the environment should be in. After the commands take place, the juju state server will act to transform the current state of the deployment into the desired one. The service units are then provided with the information necessary to configure and start the real software that is responsible for the requested workload (Wordpress and MySQL themselves, in this example), and are also provided with a mechanism that enables service units that were related together to easily exchange data such as addresses, credentials, and so on. This is close to the original scenario described, except that there’s a single frontend machine running Wordpress. The next section details how to add that second frontend machine. No further commands or information are necessary, because the juju state server understands what the model of the deployment is. 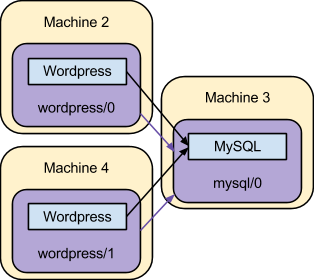 That model includes both the configuration of the involved services and the fact that units of the wordpress service should talk to units of the mysql service. Although that is equivalent to the classic deployment first described, as hinted by these examples an environment managed by juju isn’t static. Services may be added, removed, reconfigured, upgraded, expanded, contracted, and related together, and these actions may take place at any time during the lifetime of an environment. The way that the service reacts to such changes isn’t enforced by the juju infrastructure. Instead, juju delegates service-specific decisions to the charm that implements the service behavior, as described in the following section. A juju-managed environment wouldn't be nearly as interesting if all it could do was constrained by preconceived ideas that the juju developers had about what services should be supported and how they should interact among themselves and with the world. Instead, the activities within a service deployed by juju are all orchestrated by a juju charm, which is generally named after the main software it exposes. A charm is defined by its metadata, one or more executable hooks that are called after certain events take place, and optionally some custom content. The charm metadata contains basic declarative information, such as the name and description of the charm, relationships the charm may participate in, and configuration options that the charm is able to handle. The charm hooks are executable files with well-defined names that may be written in any language. These hooks are run non-concurrently to inform the charm that something happened, and they give a chance for the charm to react to such events in arbitrary ways. There are hooks to inform that the service is supposed to be first installed, or started, or configured, or for when a relation was joined, departed, and so on. This means that in the previous example the service units depicted are in fact reporting relevant events to the hooks that live within the wordpress charm, and those hooks are the ones responsible for bringing the Wordpress software and any other dependencies up. The interface offered by juju to the charm implementation is the same, independently from which infrastructure provider is being used. 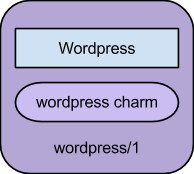 As long as the charm author takes some care, one can create entire service stacks that can be moved around among different infrastructure providers. In the examples above, the concept of service relationships was introduced naturally, because it’s indeed a common and critical aspect of any system that depends on more than a single process. Interestingly, despite it being such a foundational idea, most management systems in fact pay little attention to how the interconnections are modeled. With juju, it’s fair to say that service relations were part of the system since inception, and have driven the whole mindset around it. Relations in juju have three main properties: an interface, a kind, and a name. The relation interface is simply a unique name that represents the protocol that is conventionally followed by the service units to exchange information via their respective hooks. As long as the name is the same, the charms are assumed to have been written in a compatible way, and thus the relation is allowed to be established via the user interface. Relations with different interfaces cannot be established. The relation kind informs whether a service unit that deploys the given charm will act as a provider, a requirer, or a peer in the relation. Providers and requirers are complementary, in the sense that a service that provides an interface can only have that specific relation established with a service that requires the same interface, and vice-versa. Peer relations are automatically established internally across the units of the service that declares the relation, and enable easily clustering together these units to setup masters and slaves, rings, or any other structural organization that the underlying software supports. The relation name uniquely identifies the given relation within the charm, and allows a single charm (and service and service units that use it) to have multiple relations with the same interface but different purposes. That identifier is then used in hook names relative to the given relation, user interfaces, and so on. The administrator establishes a relation between the wordpress service and the mysql service, which causes the service units of these services (wordpress/1 and mysql/0 in the example) to relate. Both service units concurrently call the relation-joined hook for the respective relation. Note that the hook is named after the local relation name for each unit. Given the conventions established for the mysql interface, the requirer side of the relation does nothing, and the provider informs the credentials and database name that should be used. The requirer side of the relation is informed that relation settings have changed via the relation-changed hook. This hook implementation may pick up the provided settings and configure the software to talk to the remote side. 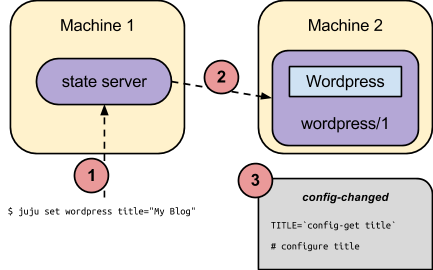 The Wordpress software itself is run, and establishes the required TCP connection to the configured database. In that workflow, neither side knows for sure what service is being related to. It would be feasible (and probably welcome) to have the mysql service replaced by a mariadb service that provided a compatible mysql interface, and the wordpress charm wouldn’t have to be changed to communicate with it. Also, although this example and many real world scenarios will have relations reflecting TCP connections, this may not always be the case. It’s reasonable to have relations conveying any kind of metadata across the related services. Service configuration follows the same model of metadata plus executable hooks that was described above for relations. A charm can declare what configuration settings it expects in its metadata, and how to react to setting changes in an executable hook named config-changed. Then, once a valid setting is changed for a service, all of the respective service units will have that hook called to reflect the new configuration. $ juju set wordpress title="My Blog"
This entry was posted in Architecture, Cloud, Design, Go, MongoDB, Project, Python. Bookmark the permalink. Great stuff! This explanation flows naturally and clearly, and definitely fills a gap in the public juju explanations. Thanks for putting it together. Thanks for the architectural description. 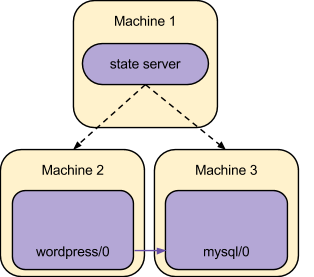 – How does state-server spawn new nodes ? Does it have abstraction over Amazon, Openstack APIs ? – How does wordpress node connect to mysql node – ipaddr or dns ? * If ipaddr, how does it handle ipaddr change on reboot ?. * If dns name, who manages the DNS infrastructure ? > How does state-server spawn new nodes ? Does it have abstraction over Amazon, Openstack APIs? Right, it has an abstraction over an infrastructure provider. Its own high-level operations sit behind a well-defined interface. 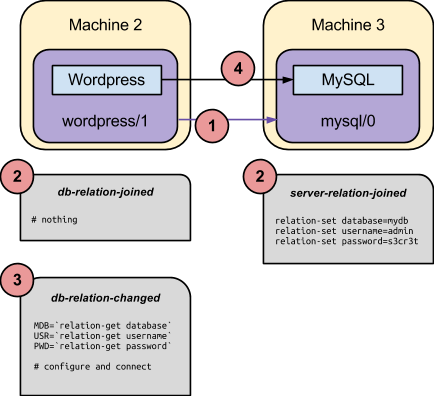 > How does wordpress node connect to mysql node – ipaddr or dns? Strictly speaking, either works since we won’t prevent people from sending whatever they want through the relation. That said, since the address is a fairly common property to want for the remote side, juju also puts that in by default, and the answer depends on the infrastructure provider abstraction mentioned above. In either case, juju does not manage the DNS internally at this time, but it can be made to work with one via charms and relations. Ótimo artigo! Informativo e direto. Tenho certeza que o juju esta na direção certa e sem dúvidas será uma referência no mundo PaaS. Really nicely done. Clear explanation of service delivery, and the clear difference between an on-premise deployment versus moving to a cloud architecture. Great blog!